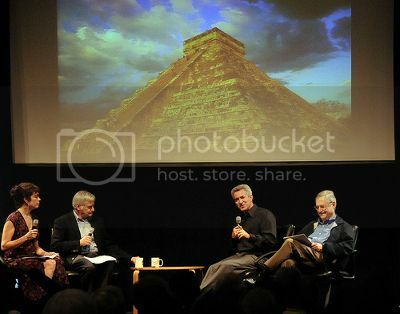 On October 27, 2012, Big Picture Science went live on stage at the Computer History Museum in Mountain View, CA as part of the Bay Area Science Festival. The event lasted a little over two hours, and we expected to edit the audio into a show for broadcast. As it happens, the event went so well, we decided to edit the audio into two shows, the first of which is available for your listening pleasure this week. Part two will be posted next week. Many thanks to our guests, Guy Harrison, and Andrew Fraknoi (pictured above at the event with Seth and Molly), the attendees, and our kickstarter supporters for helping make this possible. You can hear the show here, and feel free to share the individual segments and leave your comments. After listening to your Doomsday Show I wanted to check on the alignment of our planets. This morning at 7:25 I noticed on Google Sky Map that all of our planets were aligned and the connecting “star” is Regulus or it seems as I try to follow the long- and latitude lines. Above the horizon was Moon and Sun Mercury Venus Saturn. Below the horizon was Jupiter Uranus Neptune Mars Pluto. The planets are in orbits whose planes — the so-called orbital plane of each planet — are all different. This ensures that they virtually NEVER line up as seen from far away. I.e., they’re unlikely to be in a very precise straight line. Indeed, I’d wager that, in the entire 4.6 billion year history of the solar system, they have never once lined up accurately. They may seem to line up in the sky, but that’s only a rough alignment — an optical situation on the sky — known as a conjunction. It’s a nice view, but not dynamically significant.